Produce Bags are found in every grocery store and farmers market in the world for buying and carrying fruits and vegetables in. Red Net Fresh Produce Header Bag - 7.5 in. x 24 in. Quick Star 8.0 mic. Natural Produce Bag - 15 in. x 20 in. S-A-Day and U-Bag-Its Produce Bag - 12 in. x 15 in. Fresh-N-Tasty Plastic Clear Large Produce Bag - 11 in. x 10 in. x 4 in. 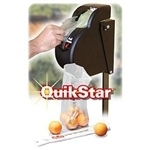 Buy your Plastic Produce Bags for food storage from the leader in restaurant supply.